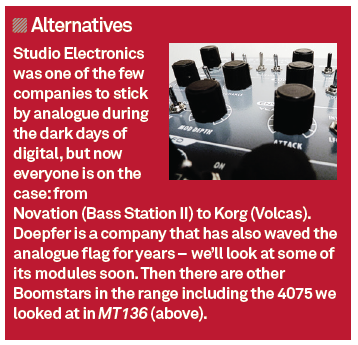 My first dalliance with a Boomstar synth, when I reviewed the 4075 was a very enjoyable experience. I explained the concept in detail, but I’ll run over it quickly now. 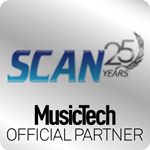 Californian company Studio Electronics has made a name for itself over the last 30 years making quality analogue synths, very much bucking the trend of the synth world at large (which for much of that time concentrated on digital). 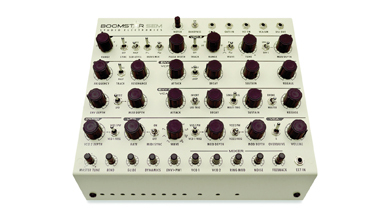 Studio Electronics’ Boomstar range comprises six models, each with a filter based on a classic analogue: the 4075 is based on the ARP 2600; the SE80 on the Yamaha CS-80; the 700 on a MiniKorg; the 5089 has a 24dB ladder based on a Moog; the 3003 is based on the Roland TB-303; and finally the SEM on test here with its Oberheim filter. 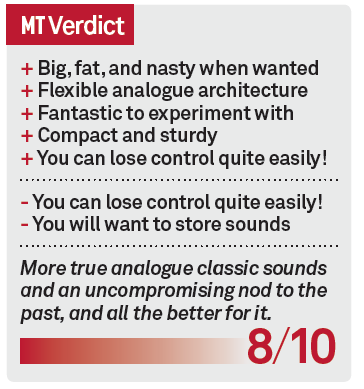 I tested the 4075 last time around and remarked on its extraordinary sound quality, but warned today’s desktop musicians to expect something very different from what they may be used to. 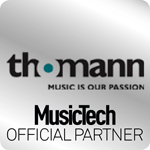 This is a no compromise analogue with no presets, no multitimbrality nor polyphony. It’s all about the sound and this range very much gives you the authentic tone of the original, adds stability, and costs a lot less. 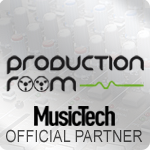 But today’s producers, may be used to having everything set out for them on a plate for less than the price of a bus fare, might baulk at the price and perceived lack of functionality compared to a software plug-in. And so to the SEM. I must admit that the ARP and Oberheim were the models I wanted to get my hands on, being a big fan of the sounds of the originals for many years (the SE80 might have to be next). Layout-wise it’s very much similar to every other model in the range – Studio Electronics clearly keeps costs down by designing each model to a template with only the colour and filter changing, plus the odd knob or rotary. In this case controls specific to the SEM are a notch filter with bandpass option (to enable frequencies only within a certain sweepable range through). Again there’s more detail in the 4075 review, but you get two stackable waveform oscillators: osc.1 mixes triangle or saw, or sine or square waveforms with a Wave Mix knob, and has a Sub Level switch to take the square wave a full or half octave down. A Pulse Width dial also controls the square wave. Osc.2 can be synced to 1 or tracked, and its waveform can be switched between sawtooth or square/triangle. Its frequency can be modulated by filter and amp envelopes. The SEM filter is controlled by the frequency and resonance knobs while envelope and mod depth are below, switchable between the LFO and VCO2. The LFO gets its own set of controls, while there are Global and Mixer dials for the main sections. The best way to move around the synth is initially oscillator by oscillator. Fade one down using the mixer at the bottom and hear how, for example, the envelopes affect oscillator 2 and how the X-Mod affects 1. You then begin to understand the structure in which pretty much anything seems to be modulated by something! Using this method you appreciate the breadth of the sound. Get used to a single oscillator this way but then bring in the other and a touch of LFO and X-Mod and you suddenly have a huge sound on your hands that doesn’t sound as monophonic as it should – if anything there seem to be at least three elements going on at one time. Again this comes down to the quality of the circuitry. I’d say, out of the two, the SEM seems to lean towards dirt and grime a little more than the 4075. It’s also a little more unpredictable in nature with octaves dropping for seemingly no reason and stuff not always happening when you think it will, but to me that equals a synth with character. And in a sea of synth plug-ins with oodles of by-the-numbers presets maybe that’s what we need. 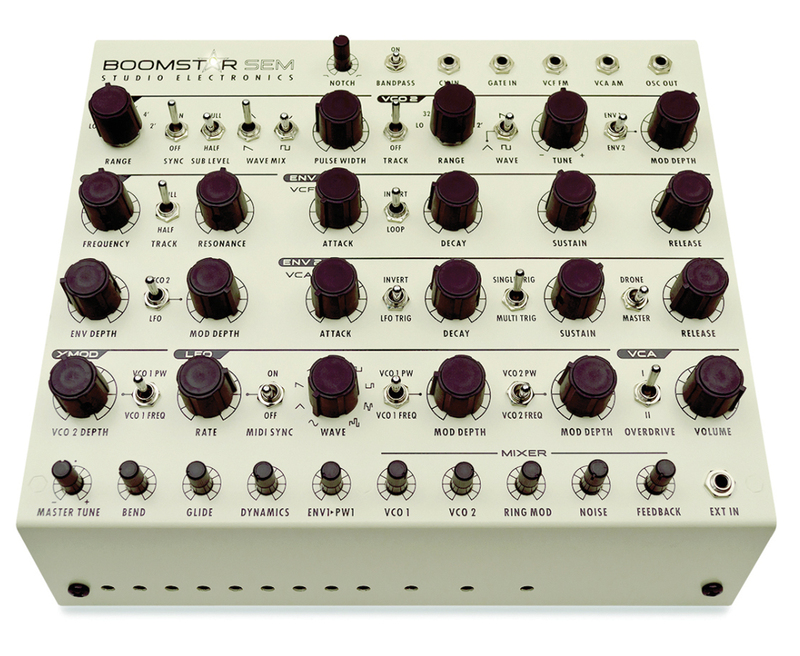 The bottom line as that Boomstar SEM is a masterclass in analogue synthesis: unpredictable, rarely off the money, and when it’s good it’s incredible.